Recently on Day 2 of my ride through the Great American West, I found myself woefully behind schedule and, if I wanted to enjoy a leisurely ride on the following day (I did), I had to make some extra miles before finding a hotel. And that meant riding until about 1:30 AM. This may seem like a no-brainer, but if you don’t ride, then you don’t fully understand how important visibility is to the motorcyclist. Riding requires a heightened level of concentration and a constant scanning of the road and roadsides in a manner that most cagers simply don’t understand. When you ride, everything on the road is a potential threat. Take away visibility in the form of darkness (or heavy fog or dust), and a rider’s ability to react to those threats becomes drastically minimalized. Roads that I’d hurtle down in a car at 85-90 MPH in the dark, or on a bike in the daylight, I will ride at about 55-60 MPH in the dark. To: field mice, weasels, birds, marmots, rabbits, raccoons, porcupines, foxes, coyotes, deer, cows, horses, elk, and moose. Please stop dashing from behind dark trees or low shrubs and trying to throw yourselves under my tires, into my boots, or over my headlamp. In the case of you small critters, I won’t kill myself trying to avoid you, but to the bird that died when colliding with my boot on Highway 93, your sudden end truly bummed me out for at least two hours. Seriously bummed. In the case of you large mammals, while hitting you is probably preferable to a high-siding avoidance maneuver into a tree, neither of us is going to feel better afterwards. Unless you’re a moose, in which case you’ll shrug off my broken body and bent bike and continue along your merry way. I’ve watched enough X Files episodes to know that people don’t get abducted by aliens while on a busy street in downtown Manhattan. No, sir. Farmers alone in their fields, hikers in the woods, and solo motorcyclists foolishly riding at night on deserted secondary roads, these are the people who end up with lobotomies after an hour on ET’s operating table. For me, riding is all about the joy of visual overload, the things you can see from the unimpaired view on a motorcycle. That freedom to look up and down, left and right, and see the entirety of the bypassing world in a way that car drivers will never understand (unless they frequently stand up with their convertible top down while going 70 MPH). This is the primary reason I hate riding at night. The denial of that visual experience. Mountain peaks, open fields, rolling hills, collapsed barns, aged trees, shuttered towns, all fade into a sea of black once the sun goes down. When I choose to take a bike on a road trip, it’s because I want to experience secondary roads that are off the beaten path, through highly scenic areas that demand frequent stops to admire the natural beauty. What’s the point of riding through such landscapes when I can’t see but 30 feet to either side? Okay, okay, there are times when riding through the night, on a quiet backroad through Wyoming or Idaho or Patagonia, can have some appeal for me. 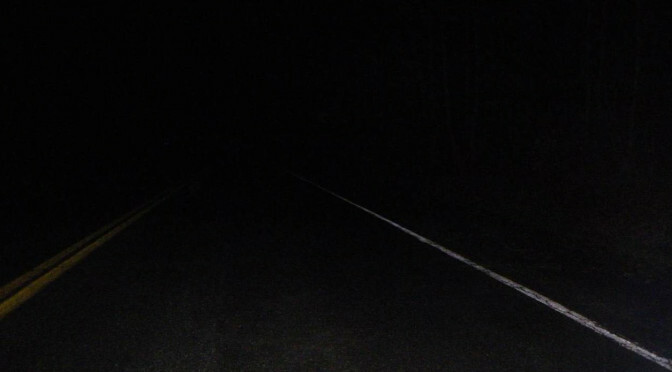 I’m talking about a road through the middle of nowhere, preferably at higher elevations (that’s at least above 5000 feet, for you flatland Easterners), with no civilizations to provide any sort of light pollution. There is something magical about being on an empty road, sedately cruising along, looking up at a galaxy of night stars shining down upon you, perhaps or perhaps not assisted by a rising moon. And then in front of you, as you look upon the dimly lit road, a shooting star crosses your path in the night sky above. Moments like that make me hate night riding just a little bit less. Alien abduction!!! I laughed out loud! But seriously, I too don’t like riding at night very much.